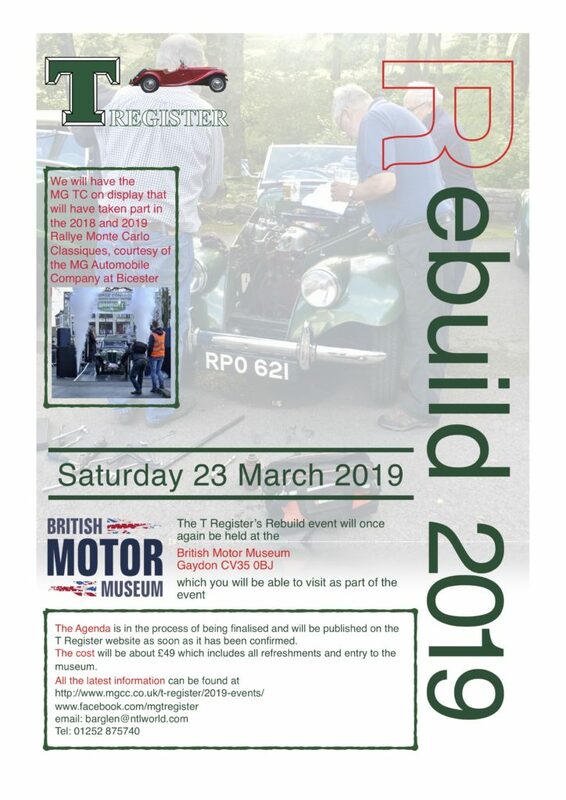 The date for the T Register’s Rebuild this year is 23 March at the British Motor Museum at Gaydon. To apply for the event, please complete the form below. Pressing the Submit button at the end of the form will send it to the Rebuild Administrator. The costs are £45 for MGCC members, £49 for non members and £35 for a ‘next generation’ or relative accompanying a full member. Lloyds Bank, sort code 30-18-88, account number 00373841 payment reference ’T Register Rebuild’. If you have any queries, please email the Rebuild Administrator, email above. Any special requirements? Vegetarian/Vegan catering? The information/materials imparted by Presenters at REBUILD is provided in good faith, but without warranty, explicit or implied.. The MG Car Club, T-Register, its Officials, Presenters & Organisers accept no liability for any actions subsequently taken by attendees based on that information or materials Always seek advice from a competent person before undertaking repairs/ modifications which could affect the safety of yourself and your vehicle. The Organisers reserve the right to alter the programme, if necessary, due to unforeseen circumstances.